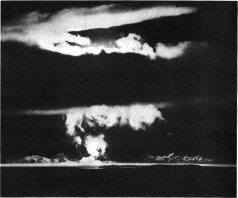 Although a series of improvements for the implosion bomb were envisioned and under development at Los Alamos even before Trinity, the first nuclear test, the end of the war had derailed these efforts. With the Cold War rapidly developing, an urgent need was felt to bring these improvements to the U.S. weapon stockpile. On 27 June 1947 President Harry Truman authorized a new test series for weapons development for the following year. 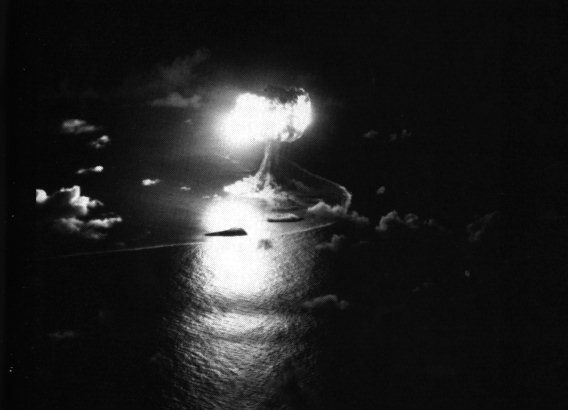 Operation Sandstone was conducted at Enewetak Atoll in the Marshall Islands in 1948 to test the first new weapon designs since World War II. The massive operation involved 10,200 personnel. Up until this time, all four implosion bombs that had been exploded (the Trinity Gadget, the Fat Man bomb used on Nagasaki, and the two bombs used during Operation Crossroads ) had all been identical, based on a conservative wartime design. The Sandstone test series intoduced a second generation of weapon design by evaluating several new design principles. In addition a number of design parameters were varied to evaluate their effects on performance. The original Fat Man pit design used a Christy solid plutonium core, surrounded by a close fitting natural uranium tamper. The Sandstone devices all replaced the contiguous tamper-core approach with a "levitated core" in which the core was suspended within a larger hollow space within the tamper so that a gap existed between them. The collision between the tamper and core would create more efficient compression of the core than the explosive-driven shock in the watime design. They apparently retained a solid core however. These devices also abandoned the use of a pure plutonium core since oralloy (uranium hihgly enriched in U-235) production exceeded plutonium production by a factor of over 3-to-1. The first test, X-Ray, used a composite oralloy-plutonium core. Both Yoke and Zebra used an all oralloy core. The pits (tamper plus core) for all three devices weighed about the same. the effect of using a "minimum strength" polonium-beryllium Urchin neutron initiator. Previously, Urchins containing the full load of 50 curies of Po-210 had been used in tested bombs. Guidelines permitted the use of initiators with as little as 12 curies, but the adequacy of these had never been put to an actual test. Given the very short 138.4 day half life of Po-210, this was an important question for maintaining a ready stockpile. Although the Sandstone tests continued to use the Mk 3 implosion system, they proof tested components that led to the fielding of the Mk 4 bomb. The Mk 3 bomb used for the Sandstone devices was 60 inches in diameter and weighed 10,500 lb total; the explosive, core and firing system weighed 7,600 lb. Both the principle of levitation and the use of oralloy-plutonium composite cores had been under development at Los Alamos during the war. If it had continued into the fall of 1945, both of these innovations would have been introduced to increase the size and efficiency of the stockpile. Now, the confrontation with the Soviet Union impelled the inclusion of these innovations in deployed weapons. The results of Sandstone led to the immediate stockpiling of both X-Ray and Zebra core designs, replacing all other designs. Taken together, this lead to an immediate increase in total stockpile yield of 75%. The X-Ray device used a uranium-plutonium composite Type B levitated pit. The uranium-to-plutonium ratio by weight was on the order of 2:1 or greater. Efficiency of utilization of the plutonium in this core was around 35%; uranium utilization was in excess of 25%. Taken together this indicates a core containing about 2.5 kg of Pu, and 5 kt of U-235. This was the highest yield device tested to date. The Yoke device also used an all-oralloy Type B levitated pit. Yoke was the highest yield device tested, a record it kept until 1951. Despite its high yield, it was regarded as an inefficient device. The Zebra device also used only highly enriched uranium in the levitated pit. Despite its lower yield than Yoke, it apparently had superior efficiency (at least for its size).